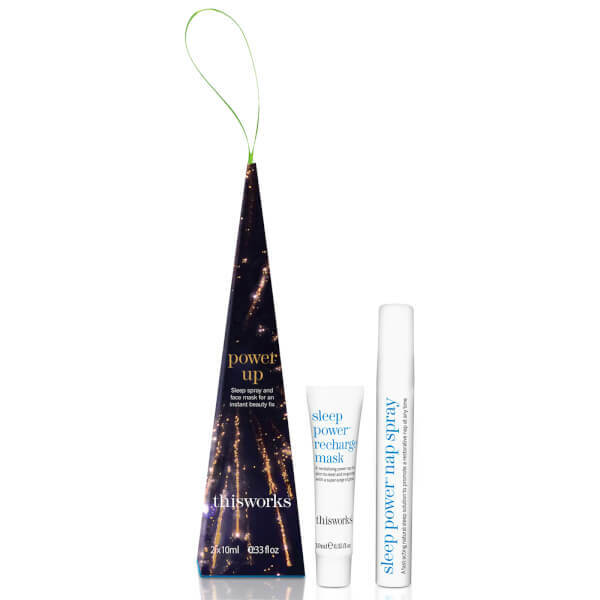 Promoting a well-rested appearance, this works' Power Up Set combines a recharging face mask and a sleep spray that help to restore a healthy glow to skin, whilst enabling easy napping when sleep levels are low. A revitalising 'power nap' face mask enriched with natural Kaolin Clay and plumping Hyaluronic Acid. Working to brighten, energise and revitalise dull skin, the bright blue face mask mimics the benefits of overnight skin regeneration to a promote smoother, clearer and, refreshed-looking complexion. Resurfacing Multifruit Acids help to recharge skin, whilst Prickly Pear extract and Amino Acids smoothen and brighten. An easy-to-use sleep aid to improve your daytime performance. Formulated with a relaxing blend of Lavender, Vetiver and Chamomile to alleviate stress and tension and restore mental balance, the spray makes it easier to nod off quickly and stay asleep, even when under pressure. After the recommended nap time of 20 minutes, you’ll feel refreshed, alert and ready to face the rest of the day. Mask: Gently squeeze the tube to release product. Apply over face and neck in an even layer and leave for 30 minutes. Place a towel over your pillow to avoid transfer of the mask. For maximum skin and well-being benefits, enjoy a 20 minute power nap before rinsing off the mask. Spray: Spray liberally over headrest, pillow or bed linen to help prepare you for rest. For an energising power nap, limit to 20 minutes of sleep by setting a wake-up alarm. Can also be used to support longer periods of sleep without use of an alarm. Mask: Aqua (Water), Glycerin, Glyceryl Stearate, PEG-100 Stearate, Cetearyl Alcohol, Vaccinium Myrtillus (Bilberry) Fruit Extract, Xylitylglucoside, Kaolin, 1-Methylhydantoin-2-Imide, Anhydroxylitol, Saccharum Officinarum (Sugar Cane) Extract, Bisabolol, Sodium Hyaluronate, Maltodextrin, Benzyl Alcohol, Xylitol, Allantoin, Sodium Stearoyl Glutamate, Xanthan Gum, Phenoxyethanol, Citrus Aurantium Dulcis (Orange) Fruit Extract, Citrus Limon (Lemon) Fruit Extract, Parfum (Fragrance), Acer Saccharum (Sugar Maple) Extract, Linalool*, Opuntia FicusIndica Flower Extract, Disodium EDTA, Gardenia Florida Fruit Extract, Dehydroacetic Acid, Ethylhexylglycerin, Cinnamomum Camphora (Camphor) Leaf Oil, Lavandula Angustifolia (Lavender) Oil, Ormenis Multicaulis (Chamomile) Flower Extract, Pogostemon Cablin (Patchouli) Oil, Vetiveria Zizanoides (Vetivert) Root Oil, Geraniol*, Limonene*. *Naturally occurring in essential oils. Spray: Aqua (Water), Parfum (Fragrance), Linalool, Sodium Benzoate, Cinnamomum Camphora (Camphor) Leaf Oil, Lavandula Angustifolia (Lavender) Oil, Ormenis Multicaulis (Chamomile) Flower Extract, Pogostemon Cablin (Patchouli) Oil, Vetiveria Zizanoides (Vetivert) Root Oil, Potassium Sorbate, Acacia Senegal Gum, Gelatin, Xanthan Gum, Citric Acid, Disodium Edta, Geraniol, Acetic Acid, Sodium Hydroxide, Limonene, Glutaral, Coumarin.